Step by Step: Got pimped! take a minute to read the introduction for this area so you can have a happy time in here. You may find tons of Articles about Miniature Painting, Sculpting and maybe other important hobby stuff in here written by the apes. They are arranged in categories to provide a simple navigation - for the categories we have used big banners, below them you find the articles. Those articles are linked via a banner that gives you a preview on what is behind it. Simply click the banner to get to the article you want to read. Important: We are working on translation of the articles to tender them in different languages. You will see a country flag in the article banner, if the article is already translated. Simply click the banner and choose your language afterwards. If you got some questions about something written in one of the articles simply post them via comment below the article. As soon we find the time we try to answer it. big thanks to those who did in the past. Or you can support us and get something in return. 375 articles (at the moment) are waiting for you to read them. If you find a dead link or a wrong link, please keep us informed via a comment in here, that would be great - Happy Painting! You can find little flags of countries behind some of the articles, that shows you in which other languages you can read the specific article. At this point I want to thank those great people who help us with the translation work, you'll find their names in the translated articles - if you miss your language in here and want to help us, please feel free to contact Roman! If you are new to the hobby I would invite you to read this Introduction to our Article section that takes you by your hand and guides you on your first steps in the jungle of wisdom. Now enjoy the article section of Massive Voodoo! Theoretical thoughts can bring your skills to the next level when it becomes something normal to you due your experiences you've made. It is necessary to know something about the stuff you work with, colours, light and shadow, how to have a go on something you never even spent a moment of thinking about, while doing. Here you find thoughts that might help you - pick out what you like and what is good for your own style of painting. A guide in theory on how you can increase your skills. David talks about his preference to work on several projects at once. Thoughts about Painting Joy by me and many jungle visitors - check the comments! Guest author Petra goes deep in psychologic depths when it comes to painting. Roman speaks about a project related motivation curve. Bored with painting only one project. Learn to master the ping-pong game. Roman takes you on a journey on how to use your eyes to study the act of painting. Roman explains how real autumn handles leaves on your bases. Roman explains his thoughts on how to learn about winter for your projects. Roman explains how you can observe Spring and put the knowledge into your projects. Become a happier painter by following these 10 rules! If you take this for credit you will be prepared on every event. Funny and interesting way to understand the colour wheel. Raffa again goes deep into colour wisdom. Raffa explains why and how colours change during night. Josua and Roman show two busts, painted in completly different color choices. Roman explains to you on two Viking models how to tackle the cold! A big guide that shows you how to conquer your blacks. A big guide that shows you how to conquer your whites. Here you find some basic thoughts about how to start with a miniature, how to work with different materials and ideas that can make your hobby even more joyful. You know Miniature Painting is like a muscle, it has to be trained to increase Volume. A pyramid is built from a good foundation, always remember. Hobby Accidents and how you can avoid them! This article was written to keep you safe! A guide to show most of the stuff needed to be equipped as a professional when painting. Cleaning up your brushes is important, this shows you how you can have a go at it. Build it on your own! Simple guide on how you can store your colours properly. Searching for a powerful light to get a bright workbench? A guide that shows you on how you can build a transport box for your finished models. A guide that gives you a good idea on how to build up a sturdy transport box. This guide tells you about the essential stuff you should take when heading for a travel with your figures! A toothpick is an amazing hobby tool. Roman tells you why! Taking a closer look on hobby knifes and other sorts of blades! See how MV's studio table was build! Check this great garbage solution for your workspace! A lot of fun! Raffa explains a good way to make your cabinet dust proof! Raffa explains the pimping of his cabinets. Article showing you how you can fix a big and heavy model to a gaming base. This article shows you how to fix your models without drilling or a metal pin. Using the figures material for true damage! A guide that keeps your weaponry looking very cool! Article showing you an easy way on how you can fill gaps after building your model. Article showing you a putty that can mostly do everything. Article showing you some hints and tips about the use of superglue. Article showing some hints and tips about easy handling your mini while painting. This Article shows you how you can clean off colour from a miniature to repaint it. Peter shows the use of Magnets on his Gladiator bust. A base is an important addition to a miniature, wheter it is small or big it always will help to tell a story around the miniature itself. Gaming bases, bigger display base to massive diorama bases, everything needs attention and with a moment of time you can make great details to base. Here you find thoughts on how to do start with a base to what material you can use in the end. A guide that takes your bases to a higher level. Josua talks about his experience in creating small bases to tell the essential. This article shows you how you can easily create your own sockets. An article which shows the use of small sockets. Working with a socket with profile. A look on what you can do. This article shows you how you can use your unused gaming bases for a good reason. Make your wood socket unique by burning it. Why there is a reason behind a black socket even during the progress. Josua gives deep insight in how you can master you water bases. This Article shows how you can work with gypsum with Hirst Art products. Roman tells you how you can create a cherry blossom tree. Our friend Kurt tells you an easy way on creating your own wall. Where there is something big, something small will always bring harmony. A guide on how you can add mushrooms to your base. Well, the title says it all! Roman explains to you the simple way of impoving your miniature projects with string. Explanation on how to create nice textures to your Milliput basing. A guide that shows you how to work with these great bricks! This article explains how you can work with real rust objects. Using old coins and some bricks to build up your base vision. Article showing you an example on how you can work with wood. Go outside, find your basing goodies! A way on how you can achieve a dried desert ground. Cork is a great material and here you can see how you can use it. Guide that goes crazy with a dead camera and its interiors. You can add simple clothing to your basework with this guide. A stone flagged base is created in here, easy and simple, good result. Using common earth instead of sand creates a more realistic effect. A guide that shows you how you can add cool posters to your scenery. Robert shows how you can do magnificant roof work. Metal punched sheet can add a cool look to your modern base. Raffa shows how you can build up tools and use them to create a brick wall. If you want to light a candle on your base, check this! Ripping apart old watches can be dangerous and fun. Matt uses eggs to create something really stunning! If you are building a cave on your base this will be useful. Josua explains in great detail how to create amazing water bases! Josua and Roman teamed up for this article to show you how you can create broken glass. Paint can chipp of its surface, why not use the reallife stuff? Different ways on how you can create fine looking dosh at your bases. Make your forest look more than a forest, don't forget the fungi! Raffa shares the secret about his spider webs. Great effect. Leaves are always a good addition to a base. An article showing how you can work wrong with 2K water effect. Fail. This guide shows you how you can work with 2K water effect. Water runs and falls, here you can see how to create it. Bringing up some green to your base with the products of MiniNatur. Detail work at grass ground work. Article that explains you how to add worn newspapers to your bases. Ever wanted to create some cool looking hanging plants? An old pirate boat full of clams and clam fouling. Creating "the burned wood look"
Using Crackle Medium, Primer and fire! A stamped label for your showcase socket. Advanced label for your showcase socket. Plastic garbage polluting our oceans? Josua points a finger at it with this beautiful water base. David takes you on a journey to tiny Japan. Roman explains steps on how to build up a postapocalyptic wasteland base. Learn to build a cool looking football field base! A crazy Fallout Wasteland Base grows, with cars, stuff and beer bottles. Roman explains his progress on a small but complex gaming base. Oli explains his creation of a wonderful base. A guide through a truely epic fantasy display base. Fear is not needed when you do quick gaming bases. Combination of explaining words and a video of the build up. Starting paint and colour thoughts and some rough light and shadow. Well, what the title says. High Elf themed temple base. Roman explains his thoughts on a Fallout/Wasteland base. Peter explains his basework on this nice figure from Infinity. Make your cool Insta-Base unique with these tricks! Roman building up a trench base for WH40k. Ben building up a gaming base for Lord of the Rings. Step by Step article on how you can create a wonderful desert base. Epic basing with something different than usual. Having a closer look on materials and thoughts during this project. Easy guide on how you can build up a mortheim gaming base. Raffa shows a step by step on how to paint marble. The son of Ahab riding high seas in a walnut gets some work for the lower parts. Showing you a display base with some cool gravestones. A view in thoughts on building up the UW2 base. Using different materials to create a jungle on a small base. Using products by Secret Weapon and Mother Earth. A look deep inside the blue ocean. Painting is the most important thing, maybe or maybe not - who knows, but for sure it is something beautiful and it is all about the fun you will enjoy while swinging your brush. It is not important on how much time you spent, it is not important how great your blendings become, it is not important if there is athmosphere or not, it is not important if you are working totally crazy with colours or if you working like a mathematic genius when it comes to paint - IMPORTANT is that you do it from the heart, straight Happy Painting, the rest grows simply out of your joy. Peter explains some explorations about why hands are as important as a brush during painting. Guest author Hansrainer talks indepth about the quality of paint! A view on the jungles priming methods. A small intrdoduction on the colours Roman uses. Keep your colours wet for a longer period of time by using a wet palette. A view into Roman's brain during the starting process of painting. Learn how to paint up your first miniature ever! All common techniques explained easy to understand. Glazes are very important when it comes to painting. A look over Roman's shoulder while he is painting a bust. An introduction into the theme of painting with real metal colours. Andrea shows how you can achieve great results by using oil colours on a knight. Andrea shows a brilliant way on how you can achieve great metallics. A collection of the results by different metal colour brands! Huge! A guide that brings you some deeper thoughts on how to paint leather. Starting thoughts and a Step by Step on the approach of painting human skin. A guide that shows paintwork on a 28 mm male face. This topic handles prominent spots during painting a busts face. This article shows you how you can add a cool demonic effect to skin. This guide gives you an example on how you can paint skin of greenskins. A demonic based freehand done on a standard bearer in 28 mm. A round shield provided with medusa's face. Big Warriors, big scars shall mark them! Beginner Article on how you can start with painting wood grain. Raffa explains a beautiful way to paint beautiful marble. Tired of painting glass? Do some real one instead. This guide shows you how. A collection to get inspired. Pure gore in here, always keep in mind that less is more. Want something really ugly to an ugly model? Read on. A way on how you can create blood slowly dropping from a point. Learn to do the stuff only magicians can. Let your miniature wave an active spell! A go on some slimy content. Article that shows you an approach on how to paint a energy axe. A thought on how you can include a real shadow on your scene. Article about warfare camouflage and how you can paint it. Doing some fur and a bow lash with your own hair. A collection of links and photos to inspire your skill of weathering. Raffa explains the "Why" behind rust. Create an amazing looking surface with these tricks explained by Raffa. The use of hairspray during your weathering session can bring wonderful results. Guide that shows you how you can create your own rust pigments. This article explains you how to apply Verdigris. Another cool effect can be achieved by using liquid mask. Article that shows you the use of salt and hairspray on different scaled models. An insight in the topic cracked surfaces. ... and what you got to know for an easy start with oil paint, by Roman. Andrea explains his way of using oil colours! Pure Essence of Petroleum, baby! Generalpoleaxe contributed this very useful article to the jungle. Roman shows a quick and a big-time way of cleaning his airbrush. Simple article on what you can achieve fast with your airbrush and some gaming models. Ferrari Girl gets a new dress and makes a dad happy! Explanations on different masking options you can use while airbrushing. Step by Step Articles you may find beneath this banner. Let the muse dance - i hope they show a bit of the process all in all and the thoughts madewhile doing or forgotten afterwards. We hope there is a bit to learn from making such an effort to show step by step articles, even sometimes steps may be weird. It is the process of creativity that strikes when you are doing Happy Painting, less thinking, so it is often a trip back to reality when making a photo in between - not easy, but i hope you understand this. Roman shows you a different way to paint a bust, strong OSL from below! Roman shows his walkthrough of this full armoured bust by Raul Garcia Latorre. Roman shows you how you can create a fire storm around a sorcerer! SbS: Painting the emotion "Envy"
Roman starts a new series of projects and puts focus on painting emotions. Oliver shows great insight in his biggest diorama. Roman paints up a big dragon bust and tells you how he did it. A great walkthrough on the paintjob of this barbarian by guest author Trent Denison. SbS: Zorkh-Seth, what is your vision? Roman explains how to apply a good vision to a miniature project? Roman gives insight into conversion work and painting his Ogre bust, chaos infested. Raffa scratchbuilds a giant Warrior of Khorne and paints it perfectly. Roman paints up a very dark and vampiric bust. Kimera's first released model, painted and explained by Roman. A hobbit that runs through the forest. Explanations on how the green will influance the full paintjob. A pirate Orc meets a Great White. A chinese tale character brought to life. Roman gives insight in a quick but very funny paintjob on a really tiny bust. A dwarf, a story and colors. Inspiration from a computer game put to a miniature. Primal! Roman guides you through painting a really large bust, Azog, The Hobbit, Orc. Raffa shows a cool bust, starting from sculpting and painting. Roman takes you on a walktrough through this icecold duel. A small Ogre bust by Raul Garcia Latorre, painting thoughts by Roman! A huge project, an epic duel, five years of work! A weird and scary model. Sick Skintone! Roman takes you on a walk through his paintjob on this cool bust! Raffa paints up a tiny dwarf from Red Box Games and gives insight in the process. Roman explains his work on a truely green frog. Roman explains his approach on this Warhammer Fantasy Lord of Chaos. Roman takes you on a journey through his work on this cool bust. Raffa takes you through a journey during his paintwork on this beauty of a bust. Forged Monkey's Lychee Priest painted up as the priest of Dragons. Raffa's Slayersword winning piece described in the progress. Sculpting an ear, baswork and painting a cool looking green skin. Peter takes you through an ancient greek myth. Our former trainee, Sanne takes you through her project. Step by Step about a dungeon scene with a barbarian. A progress explanation about a rare Ilyad Miniature. Roman explains his thoughts on his version of Charon, the rider on the Styx. SbS: What about a quick Slayer? A dwarf with orange mohawk painted up with joy. A model without a face is searching for its character. Guest author Felix gives a look behind the curtains of one of his biggest projects. A pirate bust getting painted, honestly. A dwarfen King and his shield bearers in 28 mm by GW painted and explained from A to Z. Red Box Games Hrothgar in 28 mm made finished off a brawl in a nearby dwarf bar. Step by Step that shows you Roman thoughts during painting this bust. This article explains painting strategies on how to conquer a quick display piece. SbS: Imperial Ogre Mercenary "Siggi"
A pretty old model back from 2009 but maybe Inspiration in there. A GW Demonette in 28 mm standing on a gaming base. Yedharo Bust in 1:10 of the Lion Zodiac. A gaming table Skaven Warlord by GW in 28 mm. Roberts approach on a Red Box Games stealthy assassin crawling through thight medieval streets in 28 mm. A bust of a beautiful woman turned into an undead walker. A demon bust by Wonderlands Project. Mephisto arises. A big project with five Miniatures comes to an end. A look behind the scenes of a Fantasy Hero gathering. Repainting a kid's toy with Roman. Roman explains how he adapted a comic style to a bust. A neo futurustic door bouncer. Interesting project walkthrough by Roman. Batman is unique. This is Batman! Roman creates a nightmare. Emotional paintjob straight forward. Roman paints up this bust of famous Tesla. Lightning strike! Taking a tiny X-Wing and let it crash into a cool diorama. A deathwatch space marine sketchly painted by Roman. Once again a guide to paint a Space Marine, this time yellow! Beautiful guest article by Matt di Pietro. Roman explains his progress on a rather cool and quick paintjob. Explained repainting of a prepainted X-Wing model. Peter explains to you how he plans to paint his whole army. Roman explains his work and procedure on this big Ninja Turtle bust. A truly mad project, explained in details! Step by Step of the Slayer Sword Germany 2013 Diorama . Aliens and Blood Angels. Peter explains his paintwork on a cool Infinity model. Step by Step that guides you through a cool robot kit. Raffa assaults a popular GW figure with speed and skills. Marsian basework and black/blue armour. A hero there is. Ready everyday to save the planet. Skin Painting and colour saturation/desaturation. Yu Jing, Infinity, 28 mm for gaming. GW Eldar Autarch in green, 28 mm. A big walker from GW's Eldar fraction in 28 mm. Space Hulk Terminator in 28 mm painted from A to Z. Another Space Hulk Terminator in 28 mm painted from A to Z. A GW Space Marine Captain in Terminator Armour of the chapter Salamanders. A guide for good looking and quick painted gaming figures. Got some balls to look at this? Very intresing freehand explanation by Raffa. An alien Tyranid Tyrant Guard by GW in 28 mm. Step by Step about a heavy converted Nurgle Space Marine by GW in 28 mm. Another approach on a demonette by GW in 28 mm. An evil supreme alien race appears on the horizon. Josua gives deep insight into creating this wonderful scene with a waterbuffalo. Josua and his animals. Here comes another great step by step with a hippo! Roman takes you on a journey to met a really calm waterbuffalo. Certainly a different kind of project. Let's make a fire spitting piano! Follow David through this great 1:72 historical Vietnam War mini-diorama! Roman takes you on a journey to create a beautiful car wreck in a cigar box. An abondoned tank. Forgotten in cold winter. A bust of a gorilla painted by Roman. Great insights. 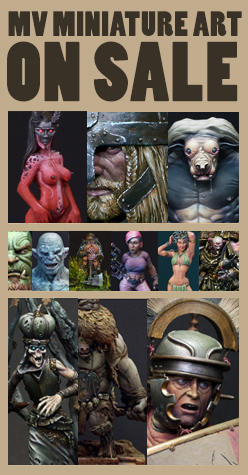 Roman guides you through his thoughts while painting up a beautiful bust by Pegaso Models. Roman's goes deep in this SBS to explain his version of a wonderful bust. SbS: The Aquila - Hero of Rome 41 A. D.
A process explanation of cold athmosphere, leather, skintone and more. A big bust plus a big fish recieves some colours. Conversion work, Disco, Glitter, Soul and Funk! Conversion work and painting black skin. Roman is bringing a 1:35 Alpine Model into a complete new setting. A great bust by Young Miniatures in 1:10. Big article! A tank step by step in 1:72 explained by Raffa. A tank step by step of a Flames of War model in 15mm. Explanation on how to proceed with figures in scale 1:72. Pimping up an old gladiator paintjob! Pimiping a true epic ride! You know that sculpting stuff only the real freaks manage to learn. May this soon help us all, i mean us, the people with two left hands. Sculpting is really a joyful time waste with great capability to become a big thing beside painting. A sculpt is far more than miniature painting, it is the essence and birthplace of it all. Roman explains his conversion work on Aradia's Toad King. Roman creates a baseball bat in 75 mm scale. Daniele explains how you can create something big that floats in the wind. Guest author Matt DiPietro explains how to use animal feathers on minis. Dress your mini up with some leather!! Guide that shows you how you can attach bowstrings to your bows or crossbows. Roman explains how Robert did the Lamps on Frutti di Mare. This guide shows you how you can add belts to your models. Creating a tiny bucket for your bases or other ideas. Old frozen ladder on an old frozen Sentinel. Roman's approach in how to scratchbuild a sword and shield. Aim well little bowmen and use the best arrows you can get. Roman's approach on this goal with patience needed. Oli explains how you can do some great mini books. Article/SBS: I want to be a Miniature Sculptor! Daniele sums up all essentials if you want to start sculpting on your own. An amazing article! Daniele gives you amazing tips how you can start to learn to sculpt in 3D. Daniele gives a beautiful insight on his work on this cool sculpt! Daniele takes you by the hand and explains each step that led to his goblin bust. Daniele once again with a beautiful full step by step on this cute sculpt! Big photo collection of statues, very inspiring. Bene explains his version of his travel kit for sculpting. To find the right proportions on your male sculpt check this! To find the right proportions on your female sculpt check this! A journey begins with first steps. Roman explains his sculpting work. Raffa explains his sculpt work at his ultraepic project. Want to add balloons to your projects? Raffa shows how you can sculpt horns to your beastman. Raffa shows some steps in photo form on how to sculpt an Orc bust. Mati shows in wonderful way how you can get your own cloaks. Sculpting "Little Red Riding Hood"
Maurizio Bruno shares his thoughts and steps during sculpting a whole 54 mm figure. Nothing special here, more useless, but maybe you might need a Teddybear someday. Nothing special here, more useless, but maybe you might need a Monster blob of decay someday. Making a photo of your painted miniatures isn't the most important thing. Somehow for showing them around it is needed as there are not much painters on this planet at all, so there might be none in your area. We have to spread the word and share our little friends in public to bring attention to our hobby and art. Here you may find the jungle way of taking photos. A guide that shows Roman's approach on taking photos. Need a photobackground for your personal use? Philip is taking a deep look inside professional equipment. Philip explains how to make good photos with a DSLR. Inspiration can be everywhere. Here you may find stuff that maybe gives you inspiration, maybe it is up to you. You can say this is the funny area between all these serious articles above. Roman shows step by step how he paints a lion on canvas. Colorful. Roman's first miniature art exhibition. Healthy breakfast will make you feel good. Inspirational post about displaying our little loved ones. Thomas explains some great experience he has made with icecream and a smile. The jungle's fine secrets revealed. Roman explains how a miniature can travel safe. No guarante, but good tips. Roman's version on how you can do a shipment of a painted miniature. For some reason, the link for SciFi Gaming Base, Trench points to www.bloggers.com instead of http://massivevoodoo.blogspot.ca/2014/01/tutorial-scifi-gaming-base-trench.html. Maybe you awesome Jungle masters could fix the link? Thanks, Francois. It should be fixed by now! Another HUGE thank you from me! Thank you for your gratitude, Marko! mir ist gestern aufgefallen, dass bei ein paar Turorials keine Fotos mehr zu sehen sind, weil Photobucket wohl Geld von euch möchte. Wollte euch nur darauf aufmerksam machen.